Diogenes, a turkey living in Ketchikan, is thankful to be a pampered pet. Ketchikan: Canoe Accident Led To The Founding of Saxman; Tribes had hoped to locate new village on Annette Island A Feature Story By DAVE KIFFER - An ill-fated winter canoe trip in Tongass Narrows more than 120 years ago eventually led to the founding of Saxman, and also, indirectly, to the founding of Metlakatla as well. The canoe accident was also, somewhat surprisingly, worthy of a story in the New York Times. The modern day community of Saxman is the result of the combination of two Native villages. At the time of its founding, 1894, residents of Cape Fox and Tongass villages chose to leave their ancestral homes and move into a newly created village just south of the tiny village of Ketchikan in order to have access to a government school and to missionaries. Both the Cape Fox and Tongass villages had existed for several centuries in the lower portion of the Alaskan panhandle. But life in those villages began to change when contact was made with the traders and explorers in the 1800s. 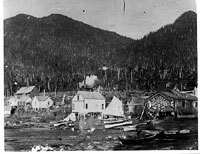 Cape Fox village was located about four miles south of Boca de Quadra, approximately 40 miles south of Ketchikan. A US census in 1880 determined that 100 people were living there. The village of Tongass was located on a small island, adjacent to the eventual United States/Canadian border at Portland Canal. In 1868, the United States stationed a small military garrison at Fort Tongass to act as the customs port for the newly purchased territory. The base was abandoned in 1870 but the customs official stayed on in the community. In 1879, US officials estimated the Tongass village population at 700. According the August 8, 1885 edition of the "Alaskan" newspaper in Sitka, Dr. Sheldon Jackson, the federal agent for education in Alaska, had met with representatives of the Tongass and Cape Fox tribes to hear their concerns about the need for a school and their stories of the havoc that alcohol supplied by the traders had done to their traditional way of life. Tillie Paul translated for the tribal leaders and then wrote minutes of the meeting for the American authorities. "A long time ago when I was a little boy a ship come into the harbor at Tongass and I ran down to the beach to see it," John Kontich of the Tongass Tribe said. "Its coming made me very happy. As a boy I ran to meet the ship, so now as a man with joy I receive your promise of a school." Southeast Alaska: Native Organizations Oppose Yakutat Mine - The Alaska Native Brotherhood Grand Camp (ANB) and the National Congress of American Indians (NCAI) are seeking to block development of a strip and dredge placer mine by Geohedral LLC near the fishing community of Yakutat, Alaska. The NCAI, a national organization that fights to protect tribal nations' treaty rights, and ANB, an Alaska Native civil rights organization with Native and non-Native members, have passed resolutions opposing mining in the Yakutat Forelands, a region between the Coastal Mountains and the Gulf of Alaska, where Geohedral LLC has staked over 91 square miles of mining claims. In addition, the people in Yakutat, population 600, have collected over 450 signatures from the region on petitions opposing any mine development in this area. "The Yakutat Forelands, particularly the Akwe and Dry Bay areas are historical sites where villages and resting grounds of our ancestors are located," states the Alaska Native Brotherhood Resolution. "This land is not only precious due to its historical significance for our clans but it is also important for our community's future generations." While the resolutions highlight the area's long history of use by Native Alaskans, the petition states that mining in the Yakutat Forelands, located in the Tongass National Forest, threatens existing uses and important salmon rivers. "The Forelands is critical fish and game habitat that the community depends on. We believe mining would threaten this habitat and therefore negatively impact current, sustainable economic industries. Yakutat's main economic industry has always been subsistence, commercial and sport fishing." This isn't the first time that the community of Yakutat has fought to keep the Forelands and their salmon streams intact. During the 1980's and early 1990's concerns about the impact of logging and other uses compelled the community have Congress designate the Forelands as a "Land Use Designation II" or "LUD II" through the 1990 Tongass Timber Reform Act. This congressional designation bans logging and associated road developments, but it does not preclude mining. "We thought we had already protected this area for future generations, but apparently there is a mining loophole in the LUD II." stated Raymond Sensmeier, a fisherman and member of the Yakutat Tlingit Tribe Council that has circulated petitions and resolutions opposing the mine. "We are just going to have to fight this battle again, and judging by these resolutions and petitions, people are willing to fight." TOM PURCELL: For Thanksgiving - Pass the Civility - It's bound to happen at Thanksgiving tables across America: A progressive liberal Democrat discovers he's sitting next to a conservative Republican. There's no need for mashed potatoes to fly. Harry Stein, an author, columnist and contributing editor to the political magazine City Journal, offers advice on how to navigate the situation. Stein, an erstwhile '60's radical who evolved into a conservative, faced a similar dilemma at a dinner party a few years ago. When the guest next to him discovered his conservative/libertarian thinking, the fellow said loudly, "I can't believe I'm sitting next to a Republican!" "It was," says Stein, "as if I was wearing not only a white hood, but a Nazi armband." So accustomed had Stein become to such broadsides -- common experiences for conservatives living in progressive bastions -- he wrote a humorous book on the subject: "I Can't Believe I'm Sitting Next to a Republican: A Survival Guide for Conservatives Marooned Among the Angry, Smug, and Terminally Self-Righteous." So what to do when bipolar political philosophies are seated next to each other at the Thanksgiving table? Make a concerted effort to get beyond "straw man" stereotypes. REG HENRY: This turkey has something meaty to say - As one who has often been called a turkey during my journalism career, I feel that I am best placed to say something about Thanksgiving from the turkey's point of view. By channeling my inner turkey, I offer the following thoughts not only concerning Turkey Day but also Christmas. This is another occasion for concern, thanks to Charles Dickens' "A Christmas Carol" wherein a repentant Ebenezer Scrooge sends the Cratchit family a turkey, establishing it as the official holiday bird. On behalf of the turkey community, not all of us in political office, it is my roosting honor and feathery privilege to be able to gobble up some newspaper space to bring our concerns before you. 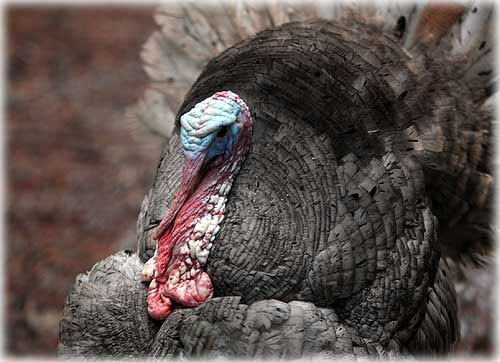 You may not have considered it before, but the plight of we the turkeys is a historical tragedy. We were just strutting about in what you called the New World, pretty much minding our own business. To be sure, the native human inhabitants hunted us, but they had a decent respect for the balance of nature, unlike some. But then the people with the funny hats arrived. Puritans! Darn busybodies! Considering the number of scarlet letters they handed out, we are not so sure they were all that pure, but maybe this is just sour stuffing on our part. Thanksgiving Away By Jeff Lund - Ten years and change ago, I made a decision I do not regret.